and I realized that the difference between Gallivan's formula and my equ. (10)—both of which describe the case where all paper is used up in only the folds themselves—is due to the different ways the physics of bending a piece of thin material is described. My description of the length of paper used in a fold is based on the length of the "neutral axis" in a piece of flat material that is bent with a bending radius of r as illustrated in my first diagram—next to equ. (4)—for the first and the second folds, indicated by the red semicircles. This axis or line is called neutral because it is free of compressive or tensile stress and, therefore, does not change its length in the bending process. For a uniform material the neutral axis lies in the middle between the material's surfaces; thus the radius of the first fold is T/2 and for the second fold it is 3T/2, bringing the length of material used in those folds to π·T/2 and π·3T/2, respectively. The series of k layers in a particular fold then is the sum of the first k odd numbers times T·π/2, or in terms of the length–to–thickness ratio L/T = π/2·(1 + 3 + 5 + .... + 2k–1) = (π/2)·k2 . As the first equation in MDH's answer shows, the length of paper used in a fold is calculated from the full thickness T of the material (MDH uses the symbol t for thickness though) as π·T in the first fold and 2π·T for the second fold, and so on, so that for k layers in a particular fold the total length of paper, relative to its thickness, used up there is L/T = π·(1 + 2 + 3 + ... + k) = (π/2)·k(k+1). I assume that Britney Gallivan's approach was exactly this one because it leads to her formula without any further assumptions (or omissions of terms) beyond the first one, namely that the length of paper used in a fold is given by the length of the outer surface of a paper layer rather than by the length of the neutral axis. 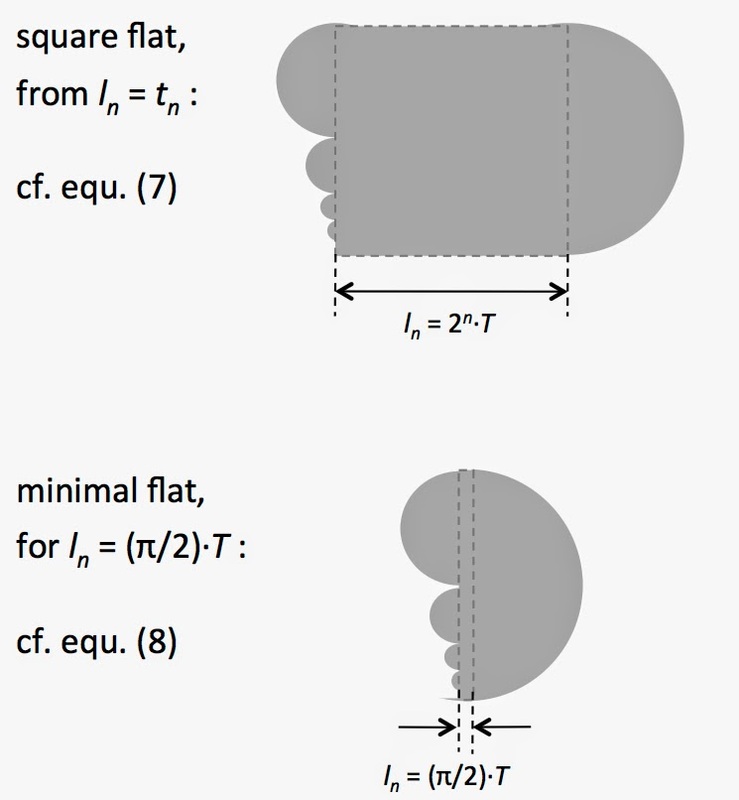 The increase in radius from layer to layer in a fold is by the thickness of the paper in each case, the difference lies only in the expression used for the first term, and in the consequence this has for the summation of the individual contributions. It is also seen that Gallivan's formula predicts a slightly larger value than my equ. (10) does for the minimal paper length required for a certain number of folds. My approach is also physically correct for the general case of describing the bending of a homogeneous piece of material although I cannot say yet whether a piece of thin paper behaves like that; for the first several folds when the paper gets creased, a "neutral axis" may be ill defined but as the stack gets larger the use of the outer paper surface for calculating the length of paper in consumed in each layer of a fold appears to be an overestimate. So the more adequate formula for the minimal L/T ratio needed for a certain number n of foldings is my equ. (10). Recently, I came across a chapter in the book by Steven Strogatz "The Joy of x: A Guided Tour of Math, from One to Infinity" on the effect of exponential functions. 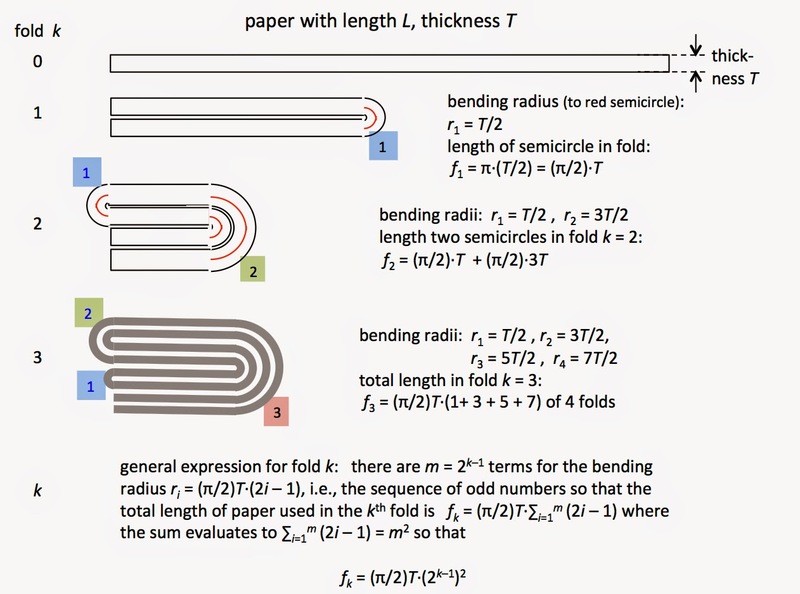 By way of an example he discusses the task of folding a piece of paper with a given length and thickness say 7 or 8 times, or generally n > 7 times. This turns out to be essentially impossible using a commonly available sheet of paper, for instance a large newspaper sheet. The reason is that the thickness of the resulting wad of paper rapidly becomes approximately as thick as the wad is long at which point another meaningful fold is impossible. He cites a formula derived by Britney Gallivan in 2002 that describes the relationship between the paper's geometry, that is, length L and thickness T, and the number n of possible foldings. This expression gives the minimal length L of a paper with thickness T needed to fold it n times in a single direction. The conditions that define "minimal length" exactly, however, were not indicated, nor was it described how the wad of folded paper looks like after the last fold has been made. So in order to better understand the formula and how it was obtained I derived a formula for the folding procedure for which the assumptions are clearly stated. A simplified version of folding paper is to cut the paper in half and stack the two pieces on top of each other. Then the process is repeated by cutting the two pieces in half again and stacking them on top of each other again, and so on. This approach ignores the effect that the folds in a multilayer stack would have on the required paper length and will thus give an upper limit to the number of 'folds' possible; conversely, it determines the minimal length L for paper of thickness T to be folded n times. It will also provide a basis for subsequently discussing the effect of the actual folding process. Before 'folding' — that is: cutting and stacking the halves — the paper has length L and thickness T; its width W is not relevant. 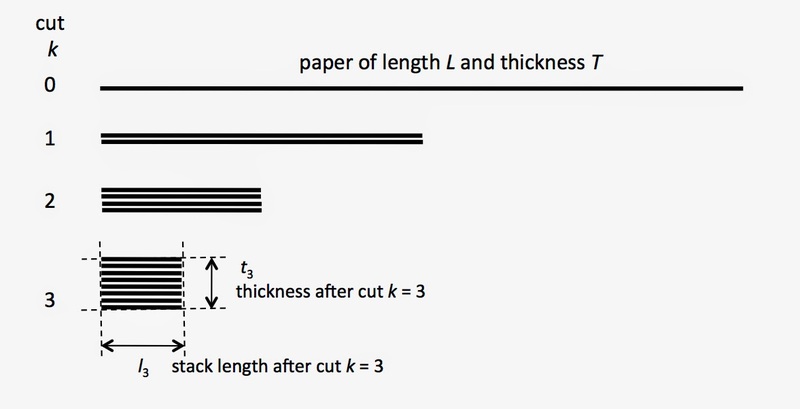 Counting each cutting by the variable k, after the first cut, that is for k = 1, the length of the resulting stack is l1 = L/2 and the thickness is t1 = 2·T, see the diagram at right. After the next cut, the dimensions are l2 = l1/2 = L/22 and t2 = 2t1 = T·22. In general, after k cuttings and stackings the stack has a thickness of tk = 2·tk–1 = T·2k and its length shrinks to lk = lk–1/2 = L/2k. of which the nearest integer is taken, n = 6 or n = 7. This means the paper can be cut and stacked either six times with the stack appearing flat, i.e., longer than high, or seven times, then looking higher than long. 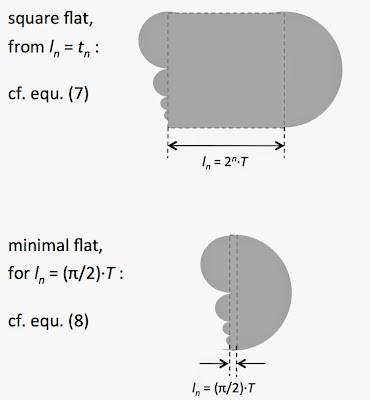 Conversely, to obtain an exact square cross section after the seventh cut, the length of a paper of 2 mil thickness would have to be 0.002" x 214 = 323/4" long. The length lk of the flat part of the stack after the kth fold is not specified yet. However, the length fj of paper taken up in each fold j can be determined and thus the total amount of paper in all those folds, Fk, can be calculated by adding up the fj parts with j running from 1 to k. As the diagram shows, the radius of the first, innermost layer of paper in a fold is r1 = T/2, the next one r2 = 3·T/2, then r3 = 5·T/2, and so on. fj = (π/2)T·4(j–1) for the jth fold. The sum S = ∑1k a(j–1) in equ. (5) is the power series S = 1 + a + a2 + a3 + ... + ak–1 which can also be written as S = ∑0k–1aj . The sum of this series is S = (ak – 1)/(a – 1) which gives, for a = 4, cf. equ. (5), the expression S = (4k – 1)/3 = (22k – 1)/3. (ii) providing a common multiplier of (π/2) for both terms in equ. (6). which happens to be the Britney Gallivan formula. The difference in L/T between equ. (*) and equ. (8) is (π/6)·3 = π/2 ≈ 1.57 independent of n which can indeed be neglected for n≥4. The difference between these folding procedures, that is, the effect of the choices for ln on the shape of the folded stack can be visualized from the diagram at right for n = five folds using equs. (7) and (8). as can be best seen by using equ. (6) again for the analysis. This length-to-thickness value can be considered the upper bound on the paper-folding exercise. which is just one fold less than what is described with equ. (9). Incidentally, equ. (3) and equ. (10) combine to the folding described by equ. (7) which is obvious from the selections: square aspect of the flat part of the stack and no folds, equ. (3), vs. no flat stack part and only folds, equ. (10), add up to the choice ln = tn for equ. (7). The table below gives paper lengths in units of paper thickness, that is, the ratio L/T, required for the number n of foldings to be possible for the cases discussed above. It gives an impression of the paper geometries required for n = 4 or more folds. Since for n ≥ 5 the terms –1 or –4 and even the term +3·2n can be neglected for a still fairly good estimate of the situation, that is, with less than 10% error and much less for higher n, the simple case of the 'cut & stack' from Equ. (3) gives a good upper limit, overestimating the minimal paper length solutions of Equ. (8) and (10) by a factor of only ≈ 2 (due to the factor π/6), and underestimating the 'square aspect' case of Equ. (7) by about ~35%. Therefore, for practical purposes, a comfortable estimate of the paper length required to manage n folds is obtained from a length–to–thickness ratio of L/T ≈ 4n, and an absolute lower limit is about 10% more than half of that value as obtained from equ. (10). Since "thin paper" is about 25 µm thick (or ~1 mil. that is, 1/1000 of an inch) – and "standard paper" about twice as thick – the length of paper needed for n folds is obtained by dividing the numbers in the column under Equ. (3) by 10,000 to convert to cm and multiplying the result by ~25. Thus, for 7 folds, a typical length of "thin paper" of ~40 cm down to ~22 cm will work . To achieve Gallivan's result of 12 folds with that paper it should be a bit longer than ~220 m.